Area : 11.20 sq km. 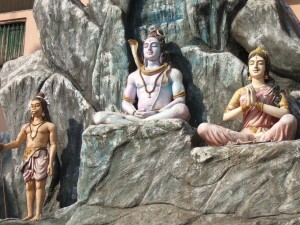 One of the holiest places on the upward pilgrimages to the Himalayas, Rishikesh is located in the north of Uttaranchal. It is 238 km northeast of Delhi and 24 km north of Haridwar. It is at an altitude of 355 mts above the sea level. The site is surrounded by hills on three sides and spreads on the right banks of the Ganges. Rishikesh is, where Raibhya Rishi did penance to please God, who appeared as Hrishikesh, hence the name, Rishikesh. Millions of Hindus come here every year, to absolve themselves of their sins by bathing in the holy Ganges. Rishikesh abounds in stories of renunciation, meditation, penance and salvation. It has developed into one of the better-known centers, for schools of yoga and meditation. The International Yoga Festival is organized every year in the first week of February. Rishikesh is also significant as the trekking base, to the Himalayan shrines of Yamunotri, Gangotri, Kedarnath and Badrinath. In Rishikesh, the winters last from November to March, when temperatures fall below 0°C. Air: The nearest airport is Dehradun (11 km). Bharat Mandir: The oldest temple in Rishikesh – the black statue of Vishnu, here, is supposed to have been consecrated by Sri Sankaracharya, in the 9th century. The event is commemorated, during Vasant Panchami, to mark the begining of spring. Laxman Jhoola: It is situated about 5 kms north of Rishikesh, is the spot where Sri Laxman, younger brother of Lord Rama, is said to have performed Tapa. 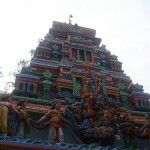 The Laxman temple was built in his memory. There was just a hanging jute ropeway without pillars. Later, the bridge was rebuilt with iron ropes. 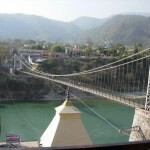 The Lakshman Jhula is a 450-feet-long suspension bridge. 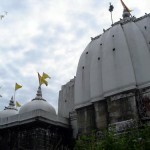 Neel Kanth Mahadev: The temple, situated at a height of 5,500 ft. above sea level, is about 2 kms from Laxman Jhoola and east of Rishikesh. It is one of the holiest shrines here. The trek up to the temple, gives a fantastic wide – angled view of the Himalayan peaks, Babhar forests and the plain below. Vilas Vinay Palace: The garden palace was once the residence of Maharaja Vinay Singh. It is about 10 km from the city center. There is a beautiful garden watered by a Lake. 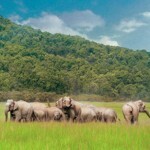 Rajaji National Park: Just 16 km from Rishikesh and situated at Chilla. This entry was posted in Rishikesh, Uttaranchal and tagged about rishikesh, ashram rishikesh, Bharat Mandir, hardwar rishikesh, haridwar rishikesh, hrishikesh, Laxman Jhoola, Neel Kanth Mahadev, Rajaji National Park, rishikesh ganga, rishikesh gangotri, rishikesh pictures, rishikesh temple, rishikesh temples, rishikesh tourism, rishikesh travel guide, rishikesh yatra, Vilas Vinay Palace. Bookmark the permalink.